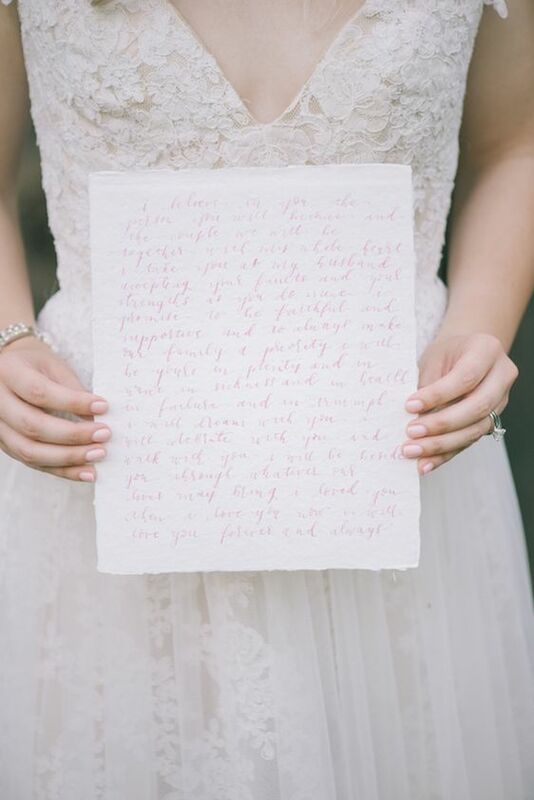 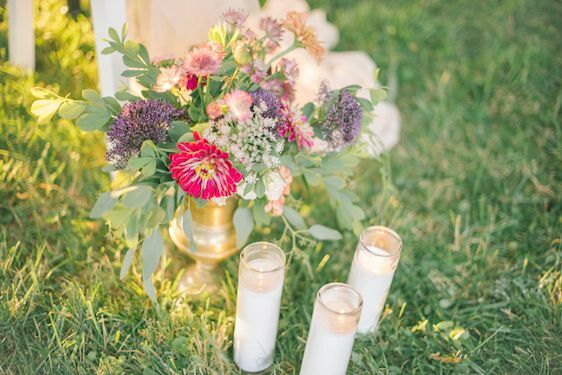 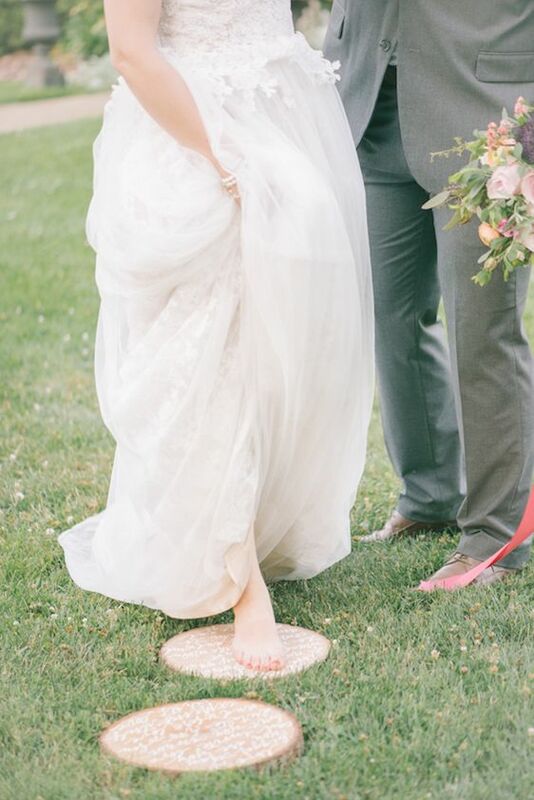 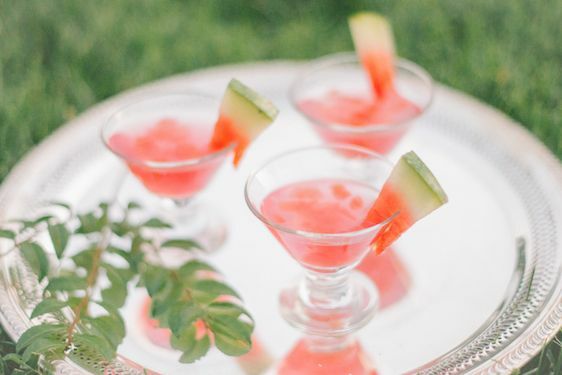 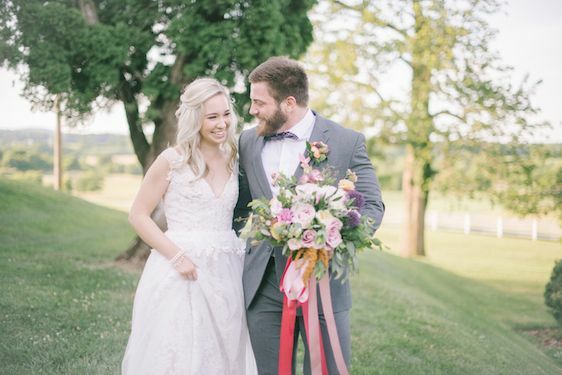 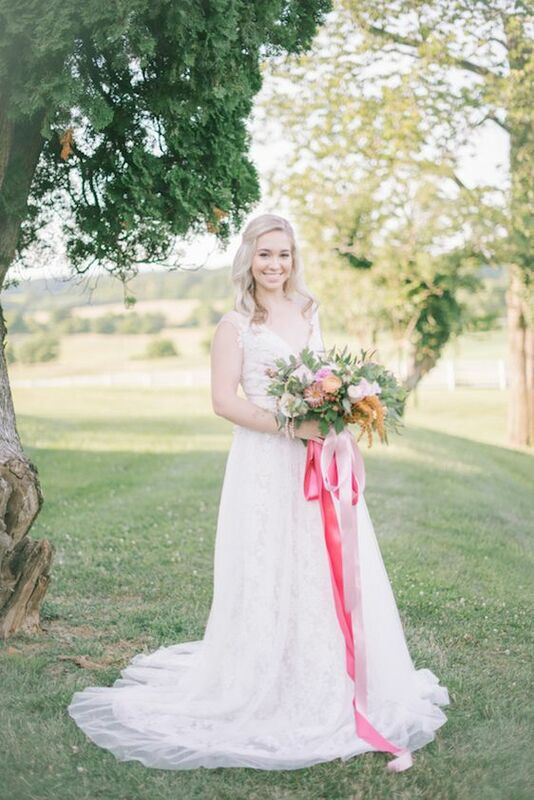 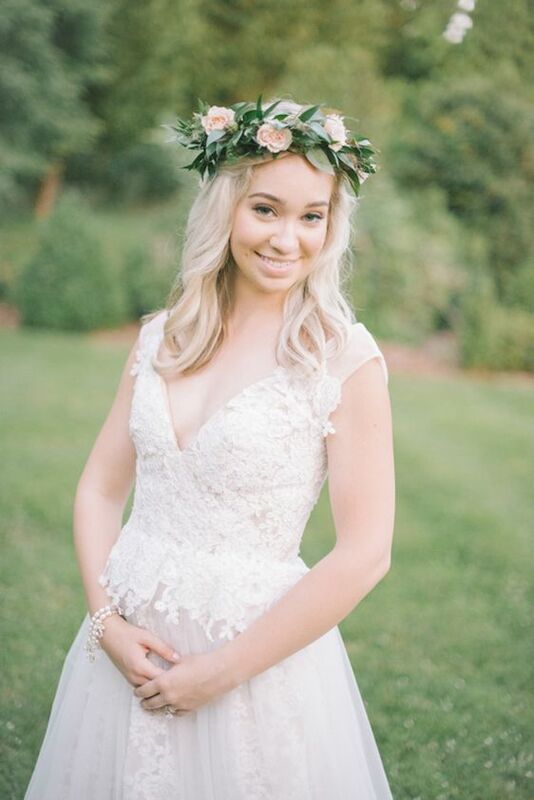 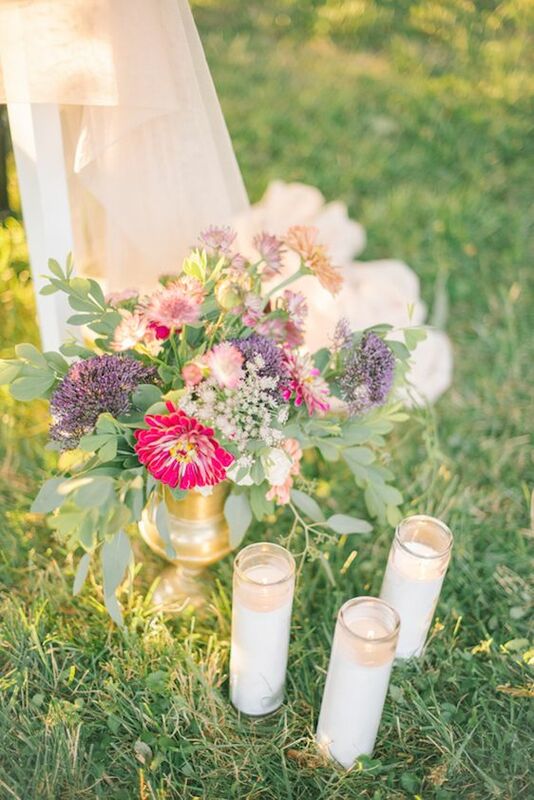 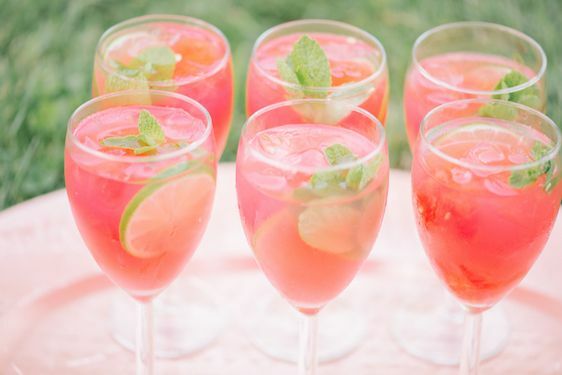 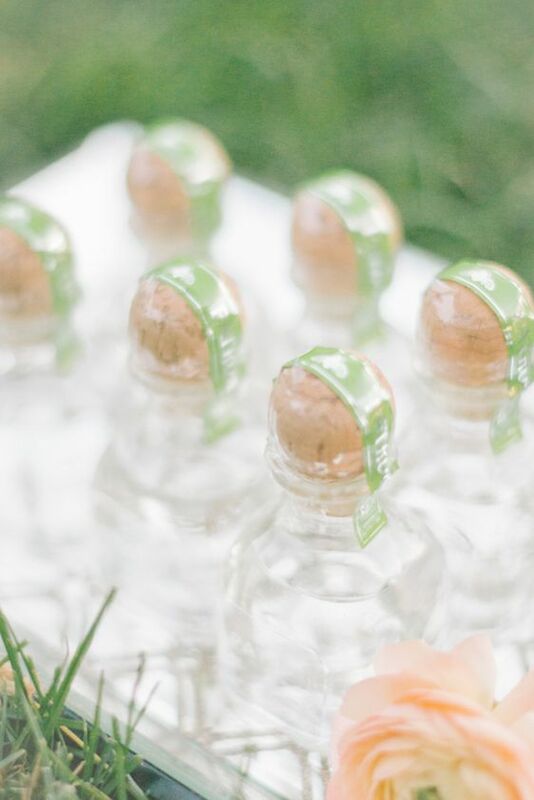 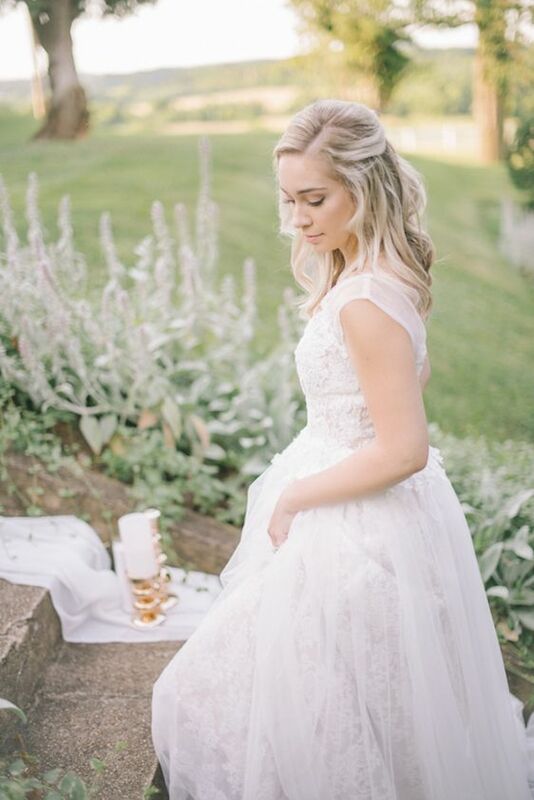 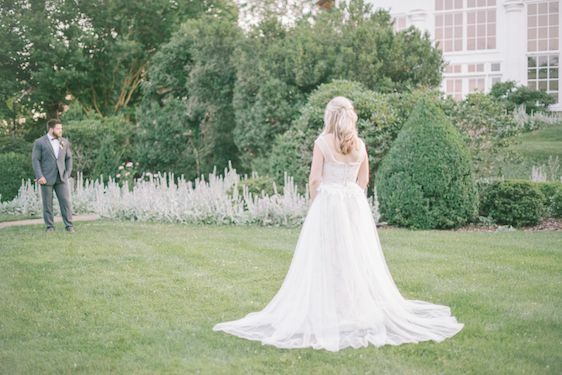 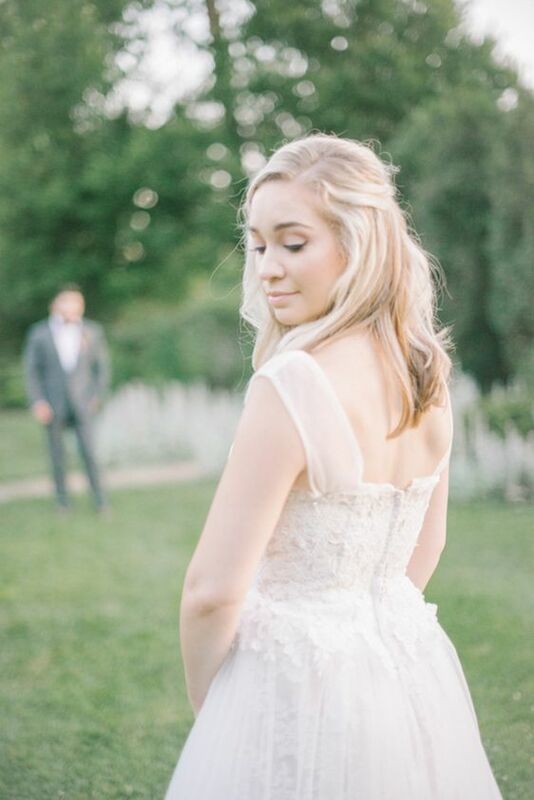 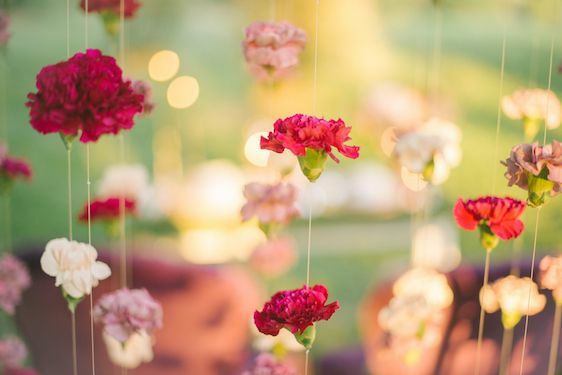 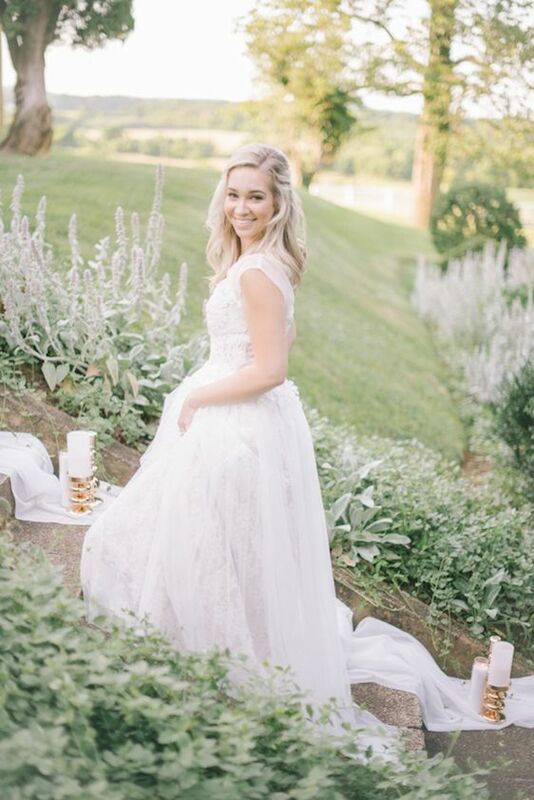 Captured beautifully by JOFFOTO and with event planning by A Beyoutiful Fete Events & Design — today's styled soiree goes down in the books as one of the prettiest, you guys! 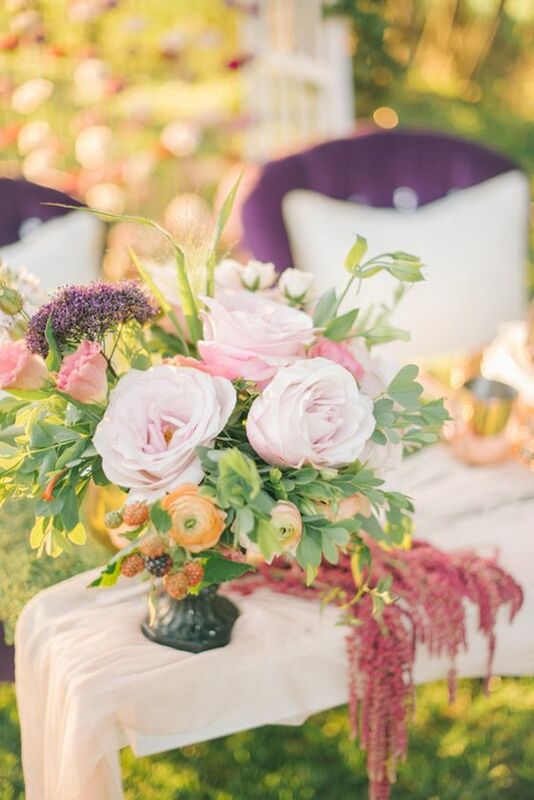 Beaumont House Design did an exquisite job with these lush and lovely blooms! 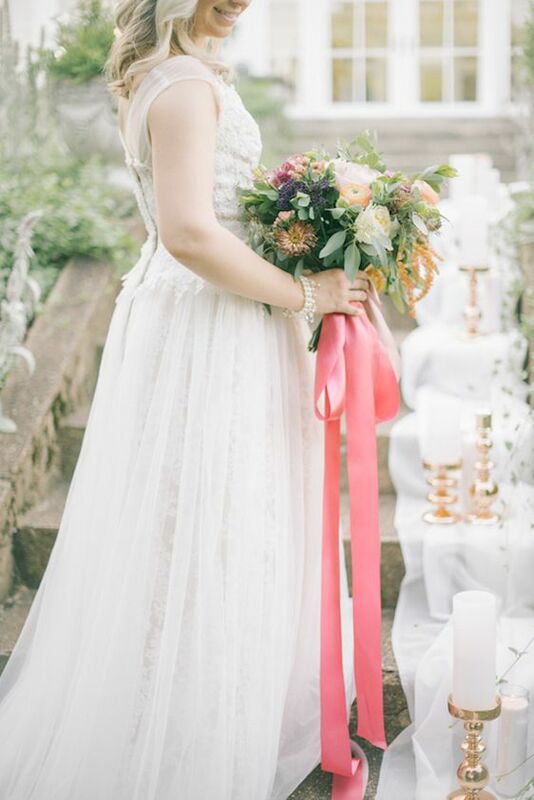 And this gorgeous wedding gown by designer Ebrada Atelier? 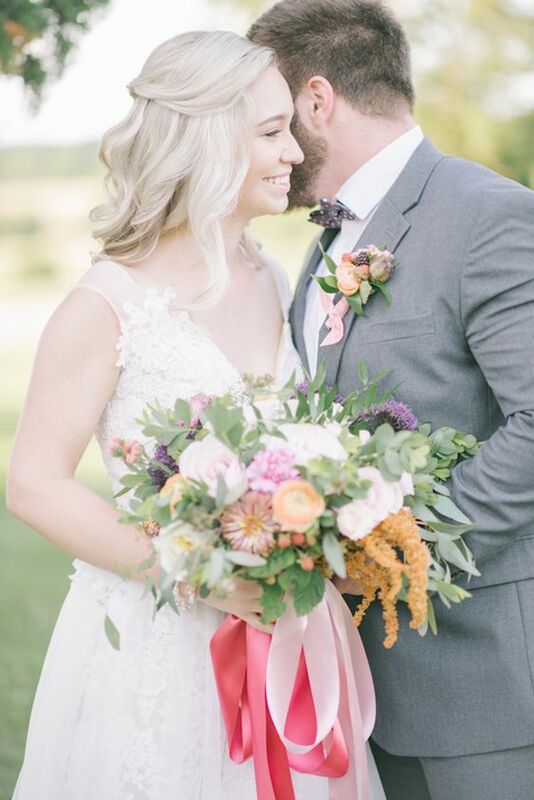 Be still my heart. 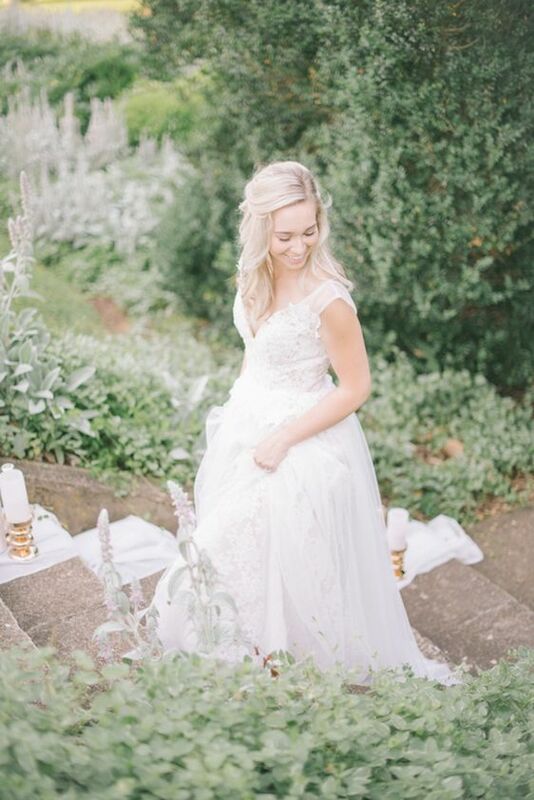 From the design team, "the concept, styling and design of this shoot is meant to inspire brides to celebrate the beauty of the outdoors." 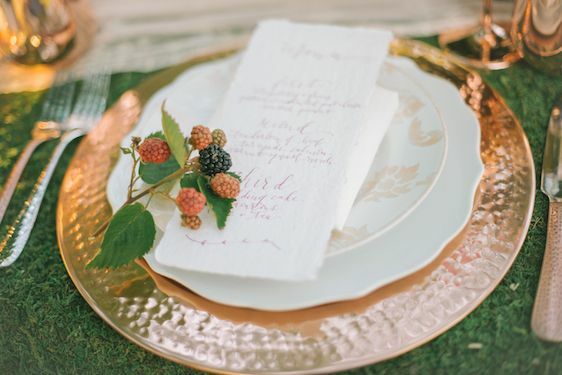 "A grove of trees, at the always so beautiful, Raspberry Plains, was the perfect locale for bringing our vision to life." 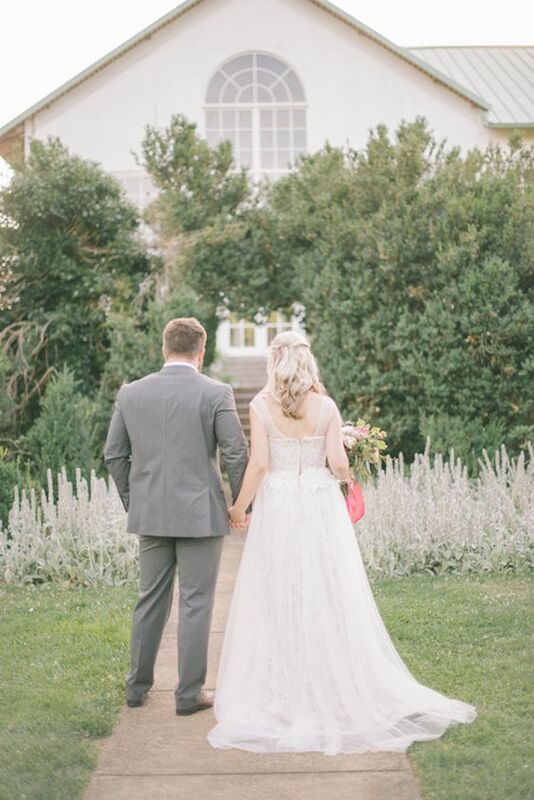 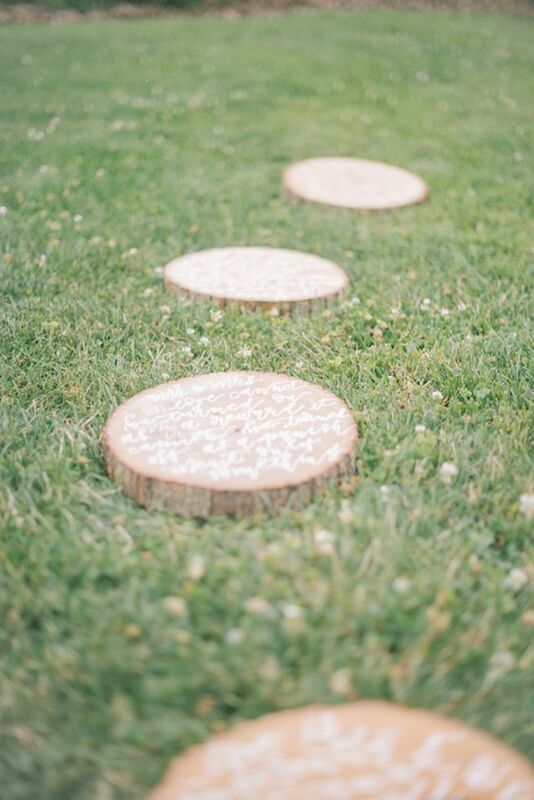 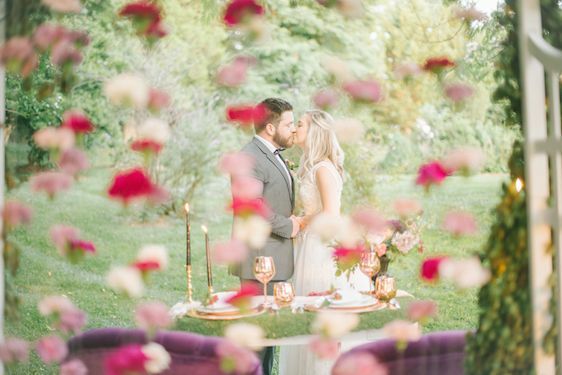 "We set out to create inspiration that exuded elegance, romance and a little mystique." 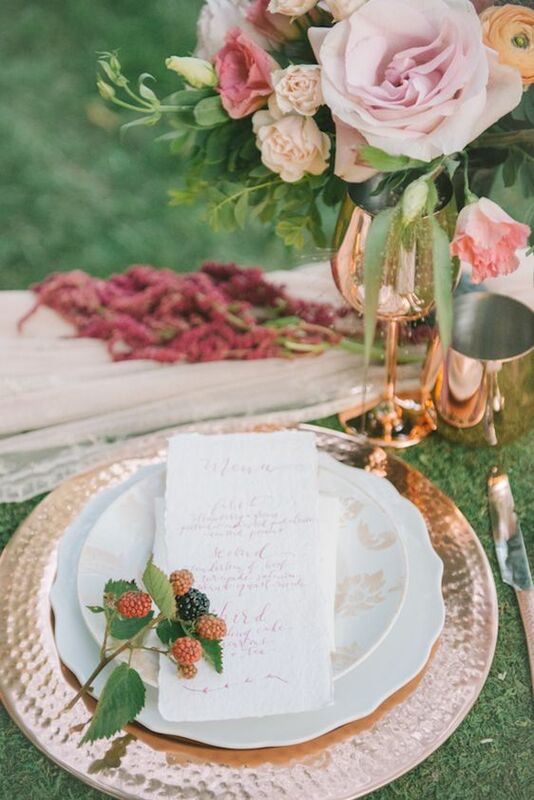 "From the calligraphy details to the tablescape and florals, every detail was carefully selected to evoke a very romantic yet moody setting"
"Her exquisite bouquet featured eucalyptus, baptisia foliage, blackberry branches with fruit, secret garden roses, amaranthus, statice, nigella pods and ranucula blooms." 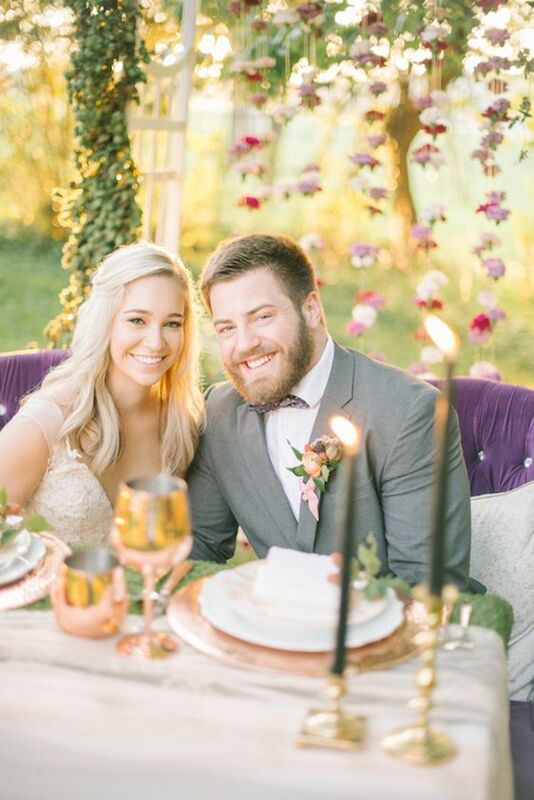 "Melon cocktails were served up as a signature drink..."
"...while the bride's beautiful blond hair paired perfectly with her lace and tulle gown." 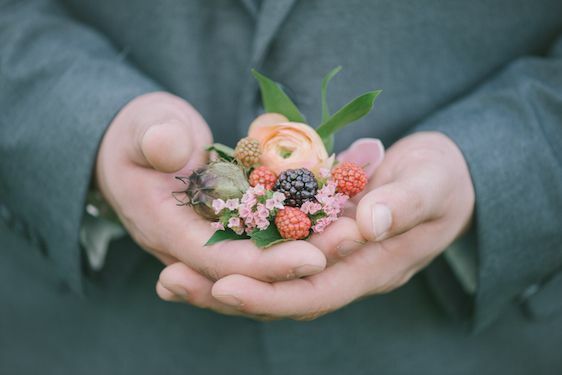 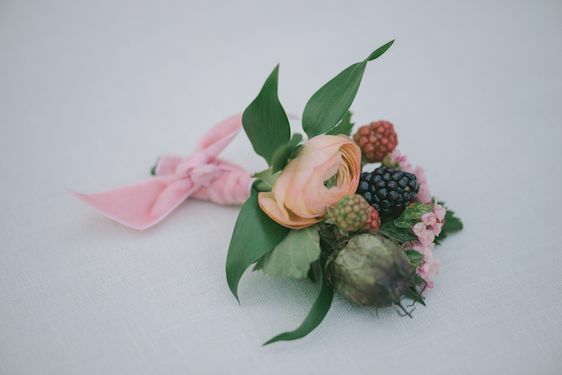 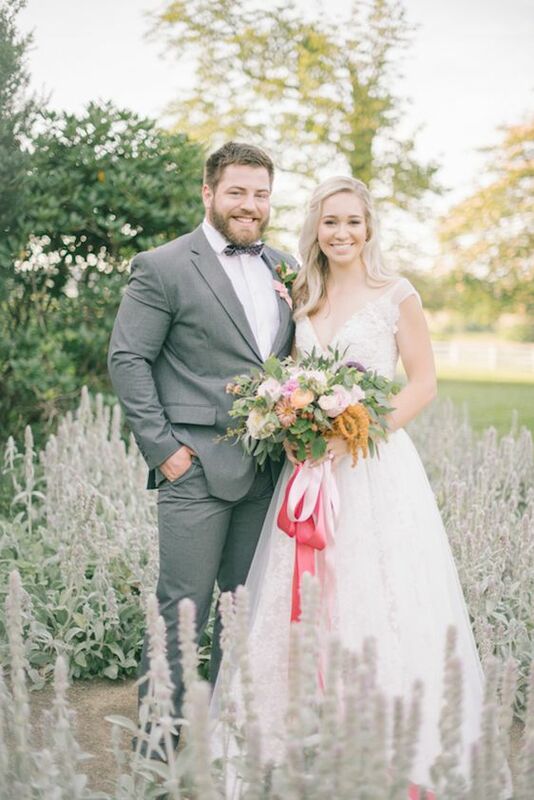 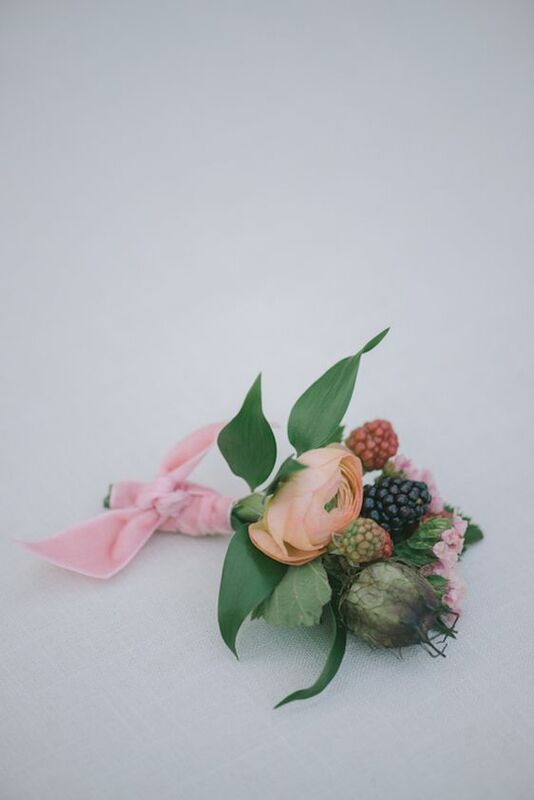 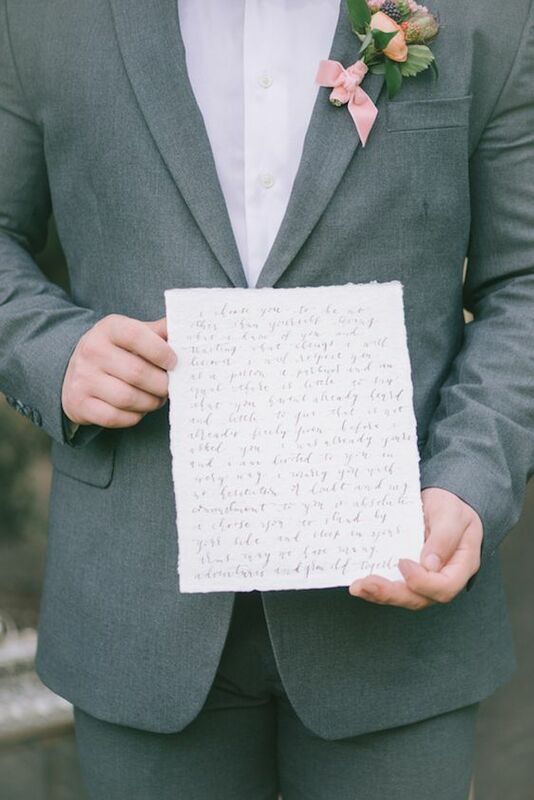 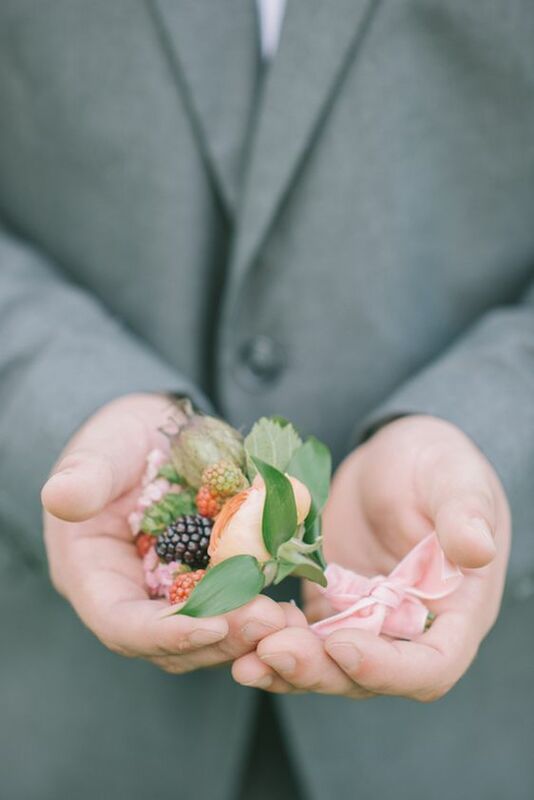 "The groom's unique boutonniere complimented the bride's bouquet flawlessly." 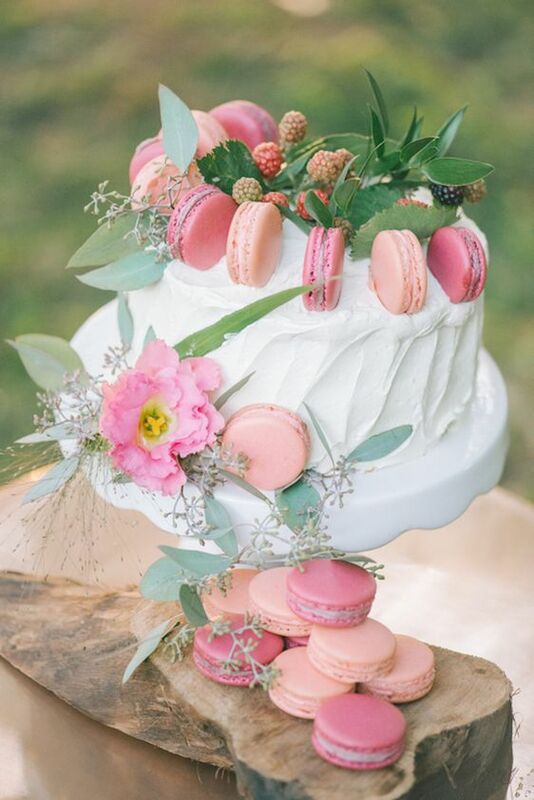 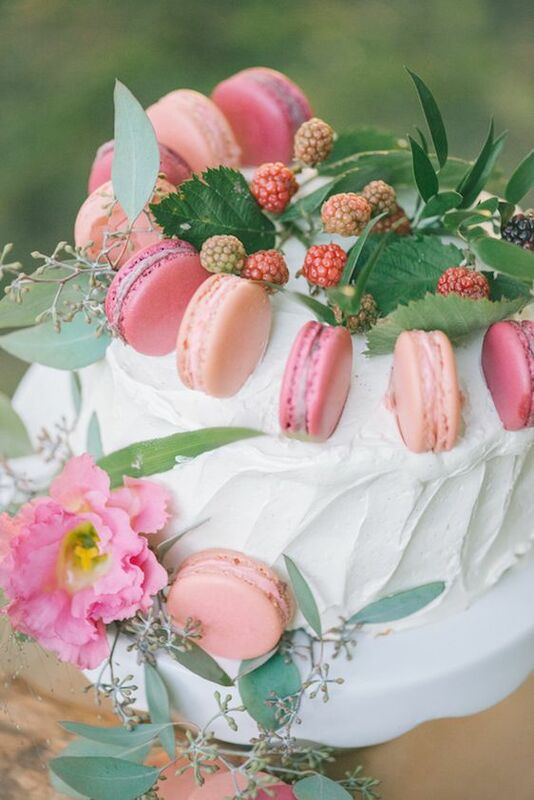 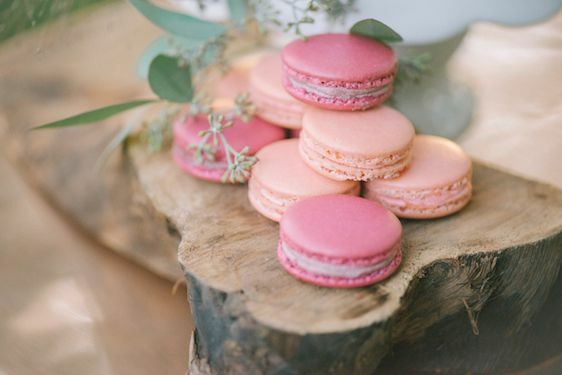 "The cake — designed by Top Shelf Macaron, was a simple, textured vanilla caked, decorated with blackberries branches with fruit, macarons, and greenery." 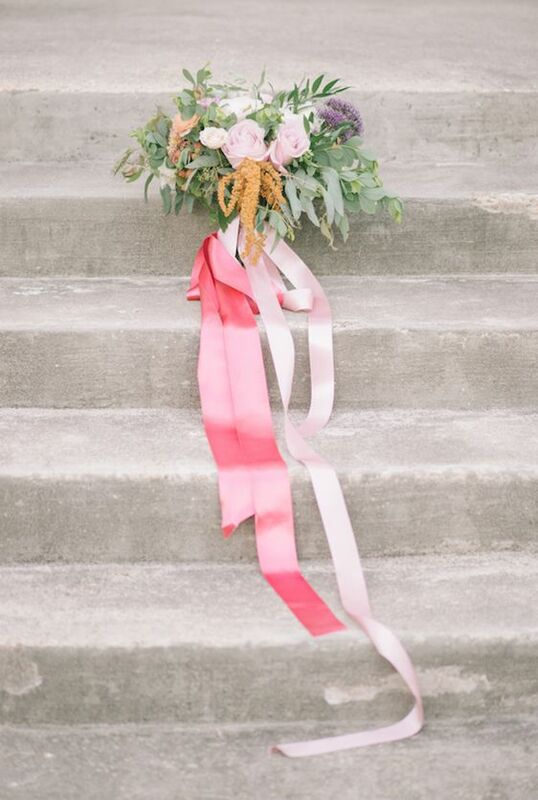 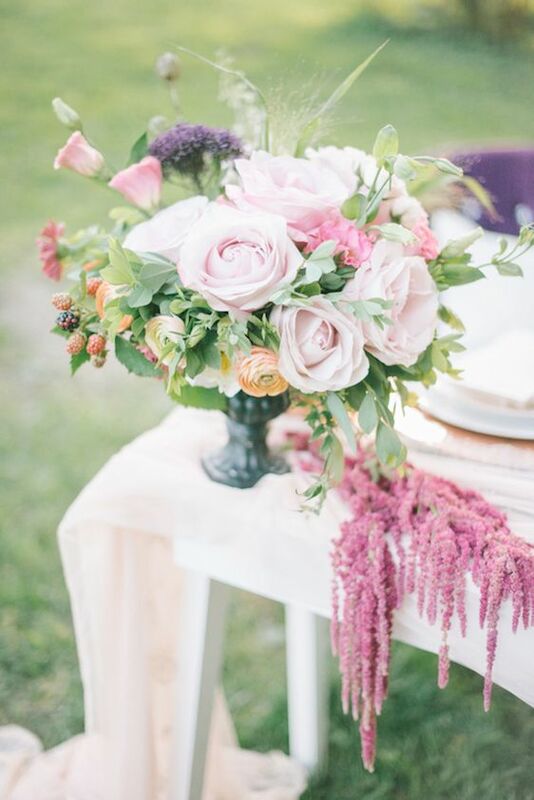 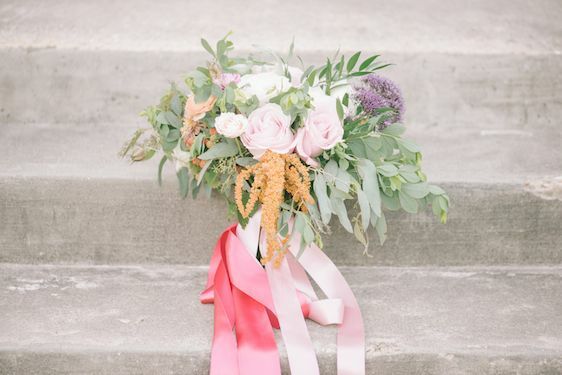 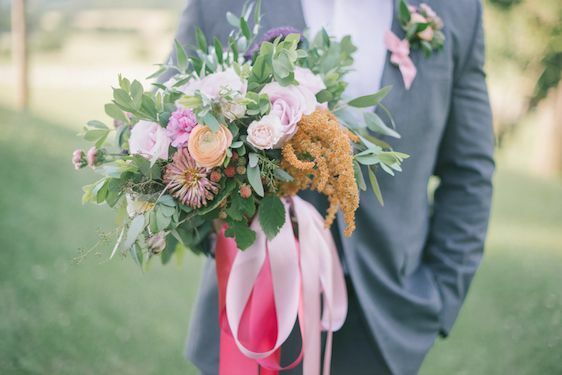 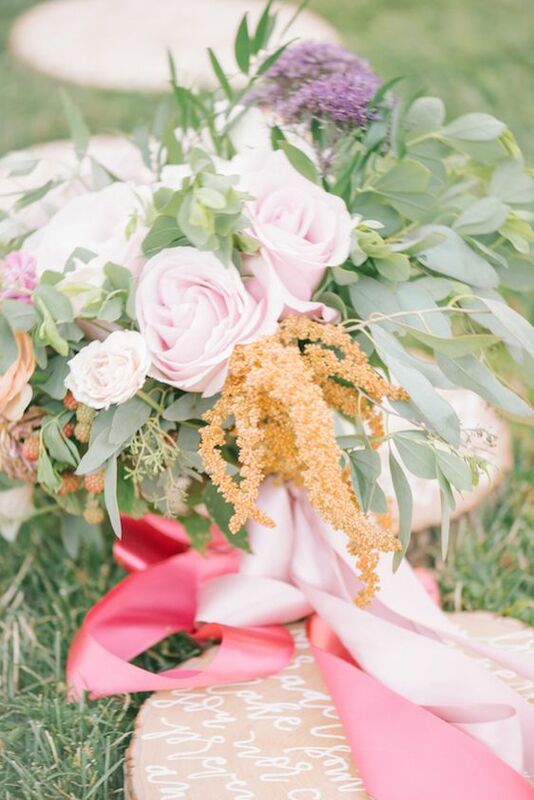 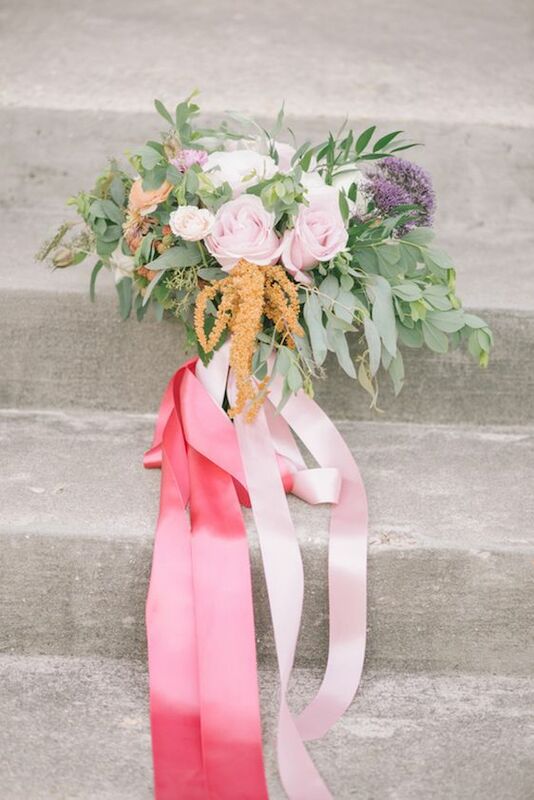 And how gorgeous is this dreamy bouquet by Beaumont House Design? 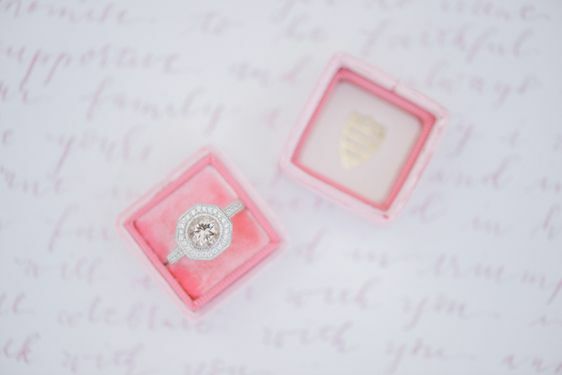 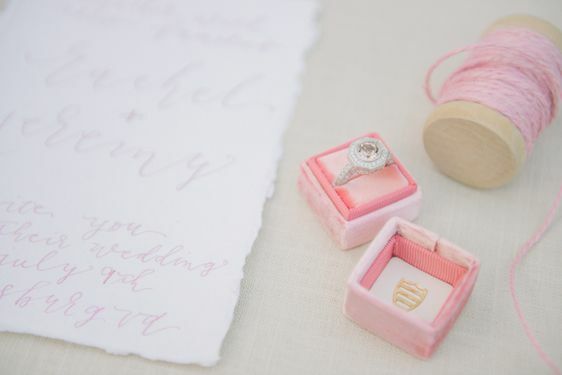 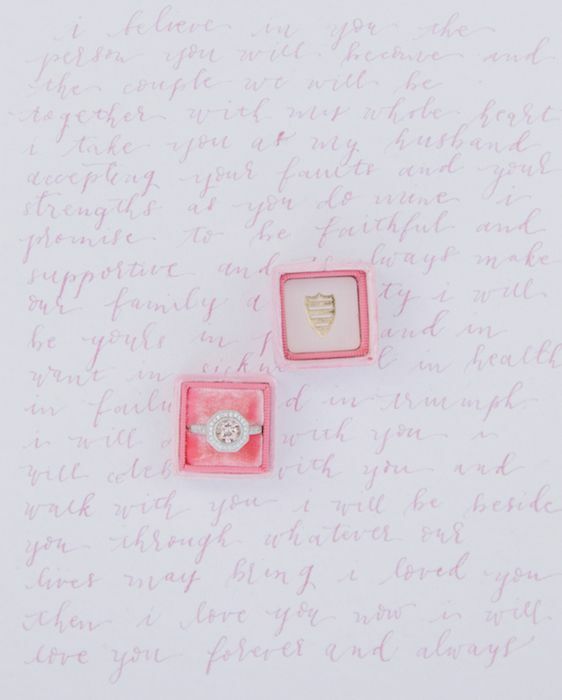 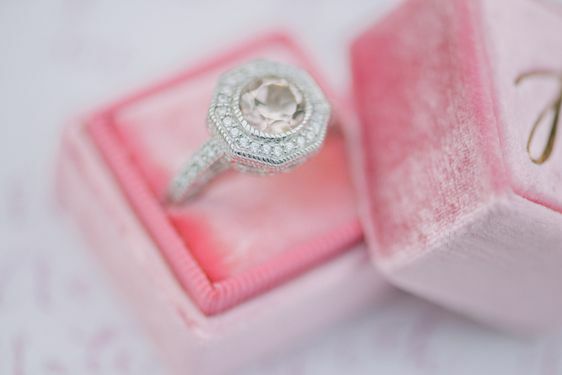 And this hint-of-pink engagement ring from Everistta Bridal? 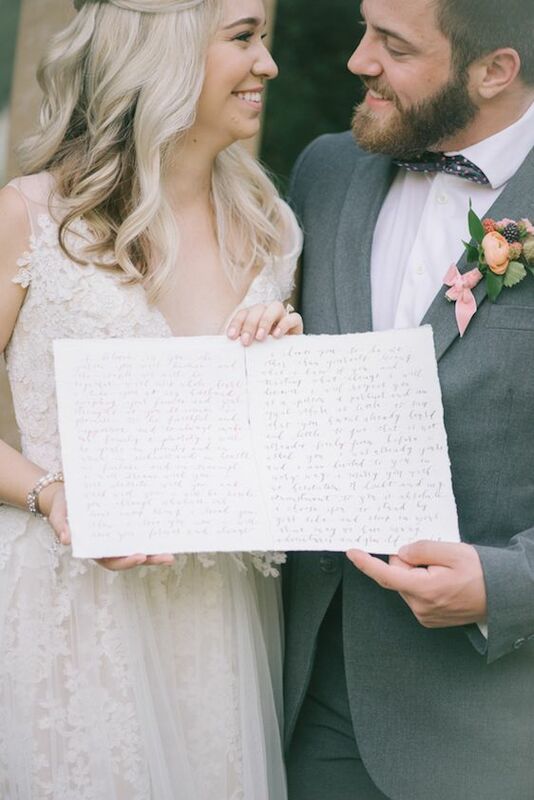 So simply swoon-worthy, if you ask me! 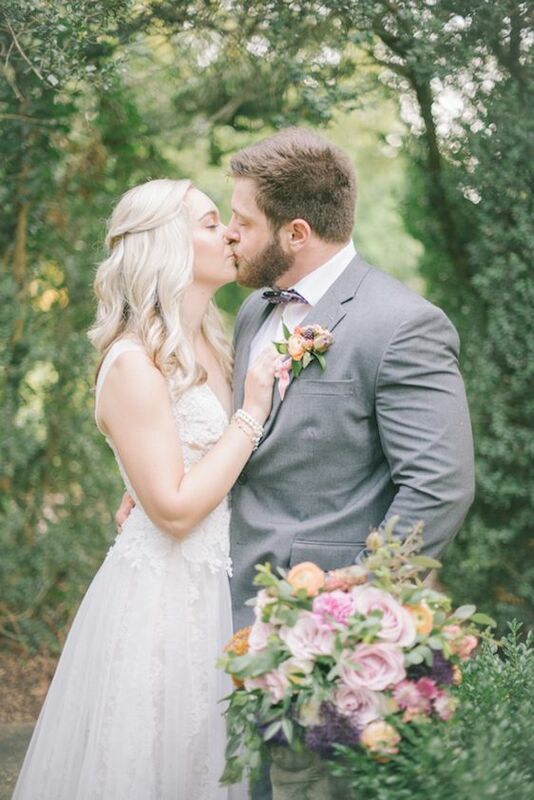 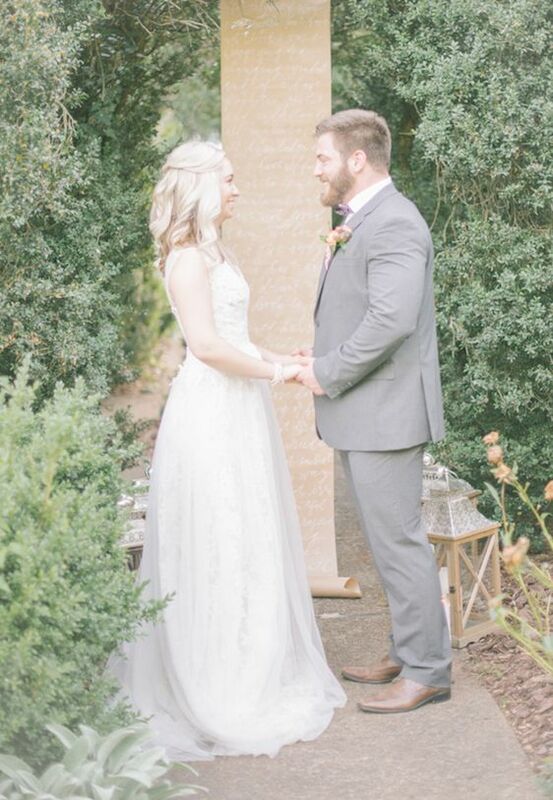 And how sweet is this "first look?" 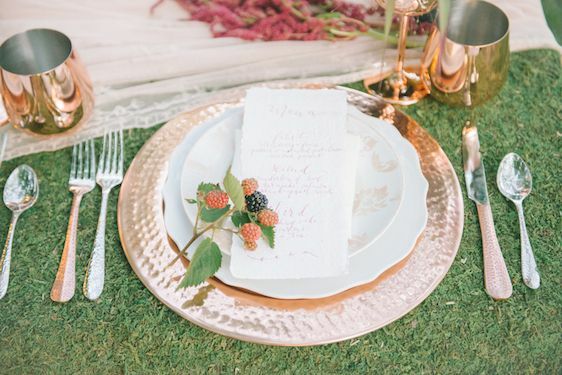 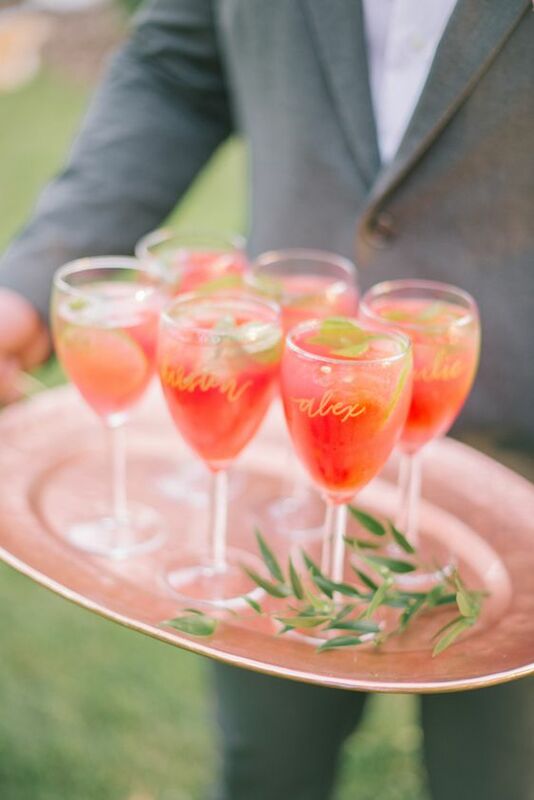 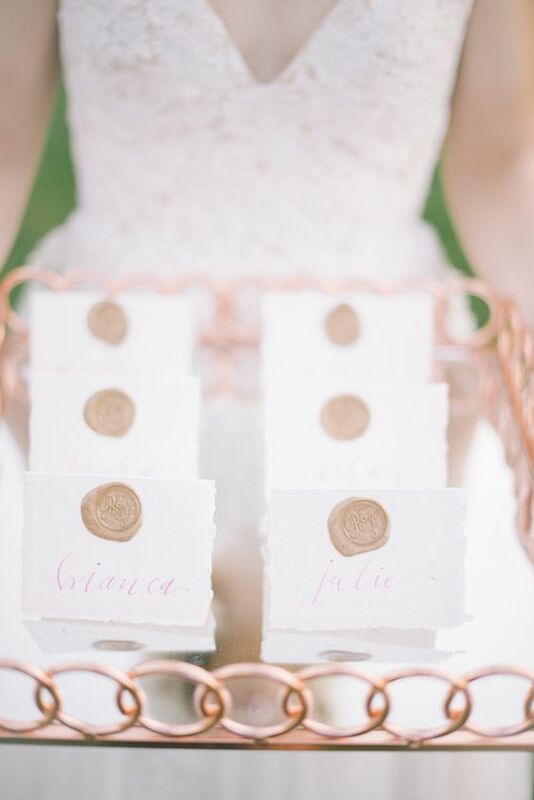 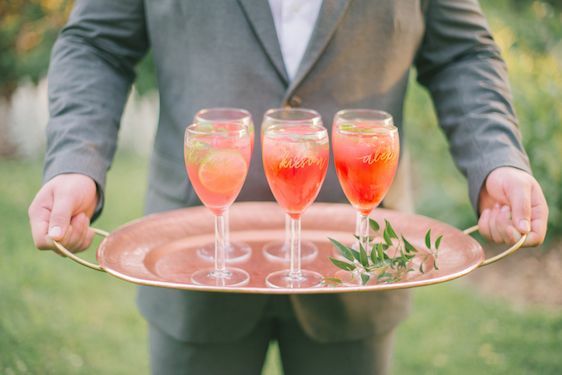 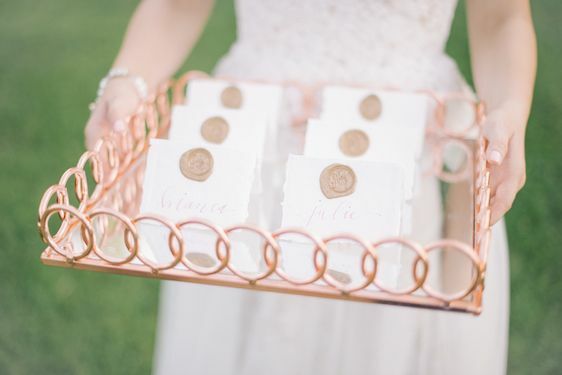 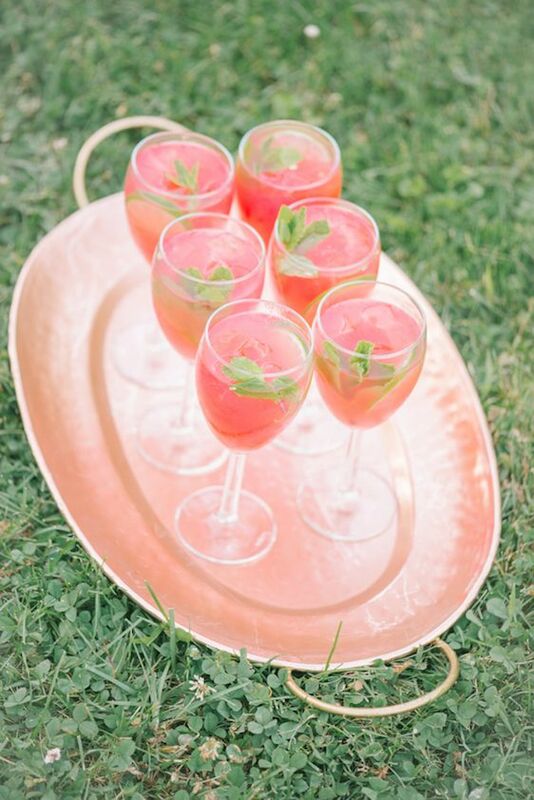 "Delicate place cards and delicious cocktails were displayed on distinct copper trays." 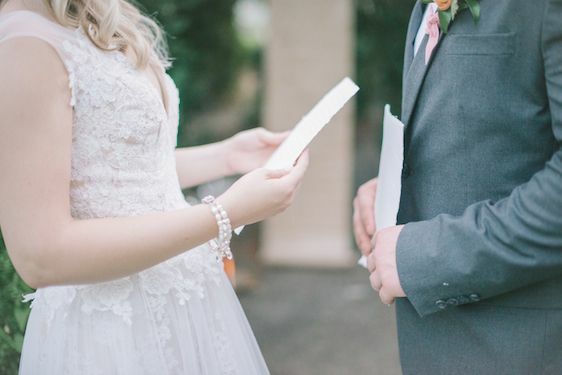 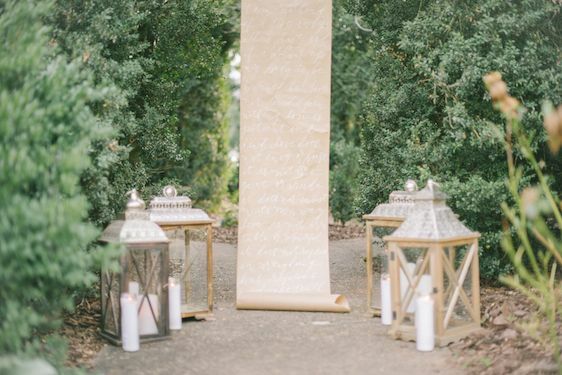 The couple stood in front of a calligraphy backdrop that cited 1 Corinthians 13: 1-13 as they read sweet vows to each other. 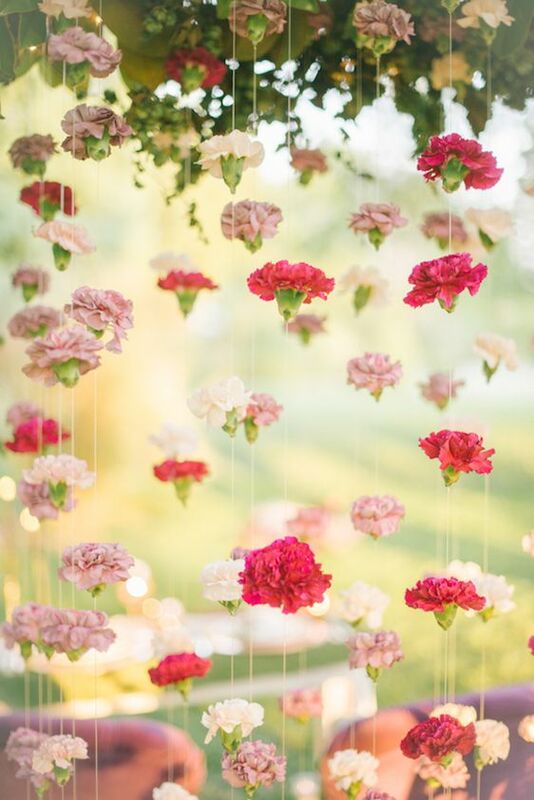 The trees offered a moody backdrop to a striking floral arch and sweetheart table. 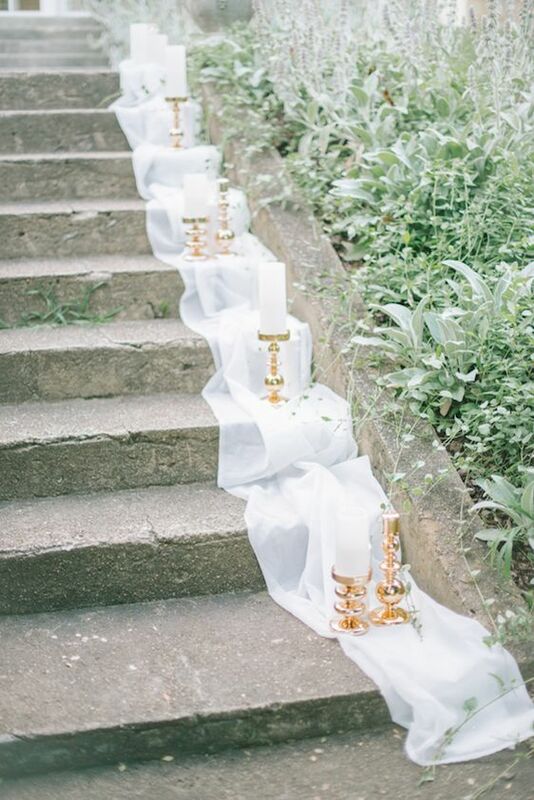 Candles and copper candleholders rested atop chiffon fabric that effortlessly cascaded down the stairs leading down to the calligraphy wooden slices, which then led to the secret garden. 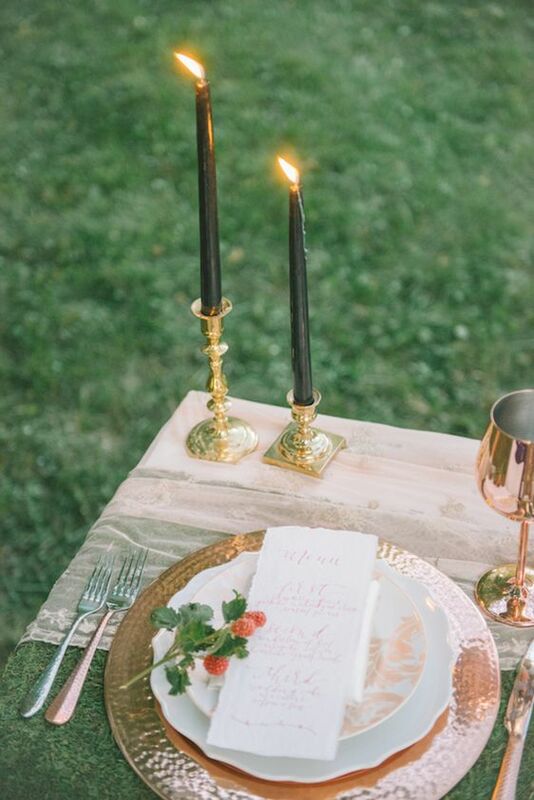 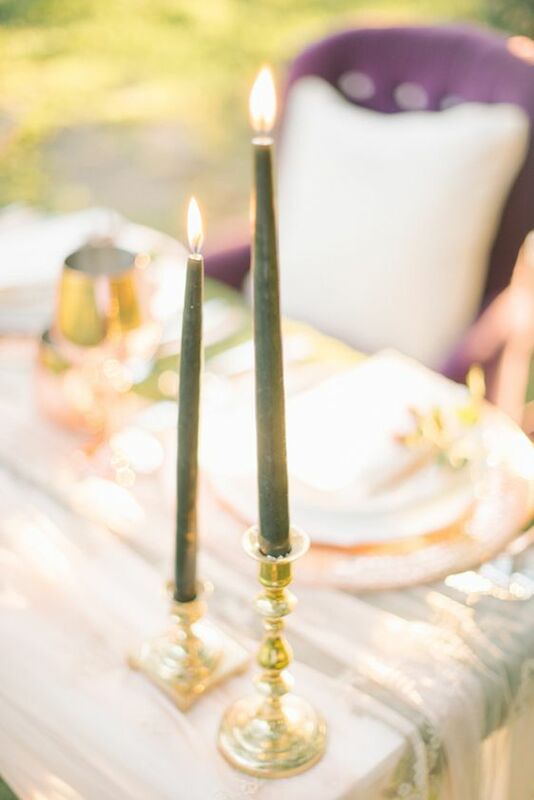 The tablescape also showcased a moss tabletop, copper and silver flatware, copper wine glasses, cascading red amaranthus, black taper candles, menus written on handmade paper, and a lush and lovely arrangement. 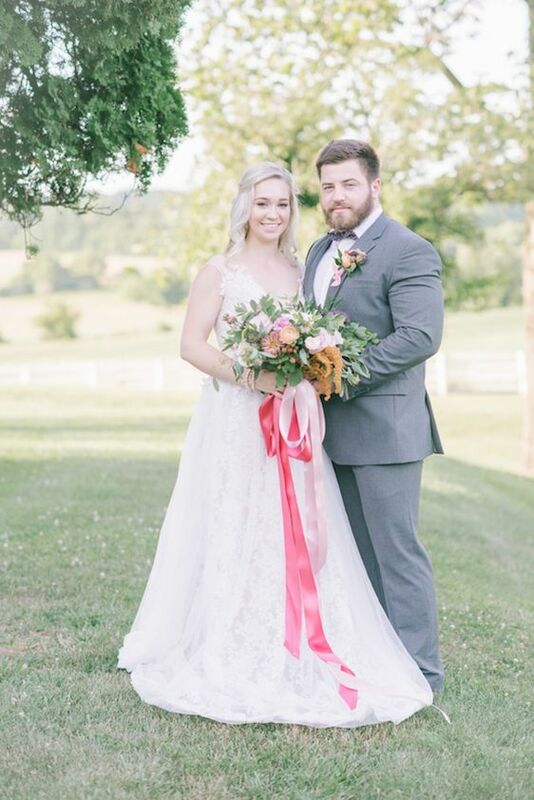 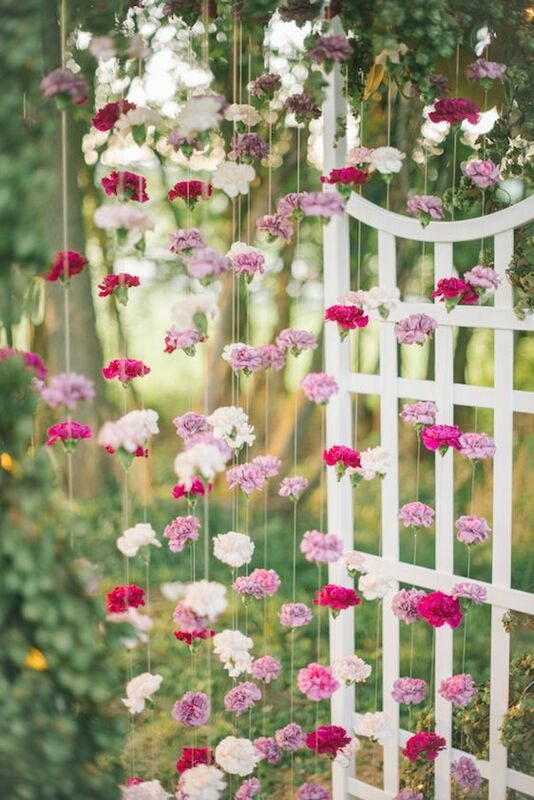 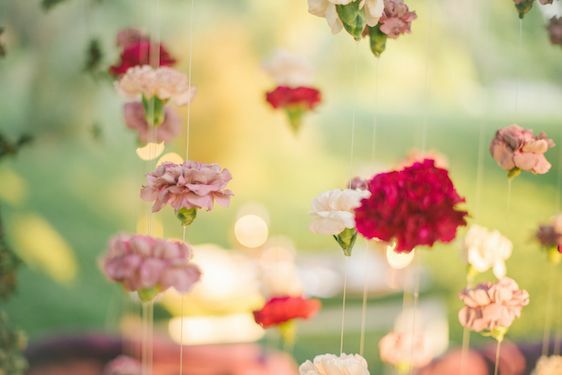 The arch was adorned with a curtain of different shades of hanging florals. 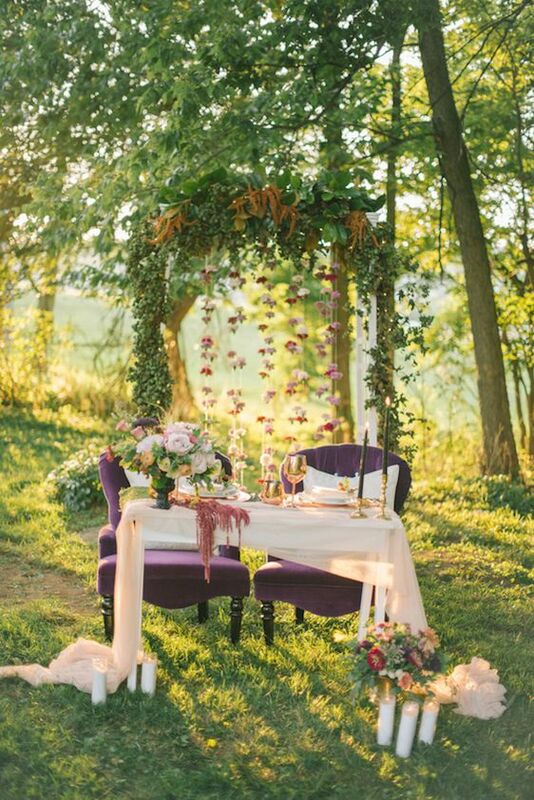 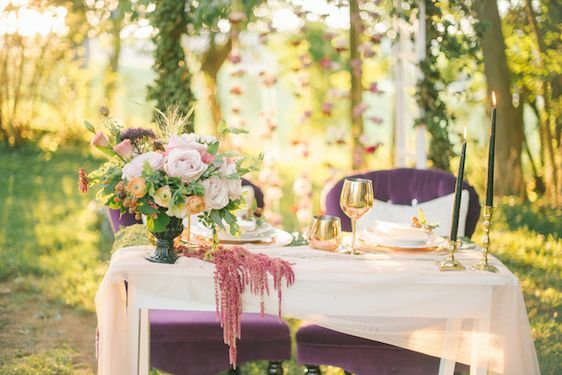 It framed the couple's sweetheart table offering layers upon layers of depth and visual interest. 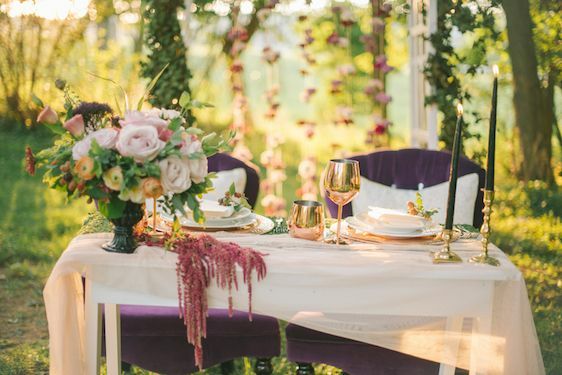 The sweetheart table had an asymmetrical design and boasted in copper details, flowing fabric, moss, and beautiful blooms - creating a very romantic yet moody setting. 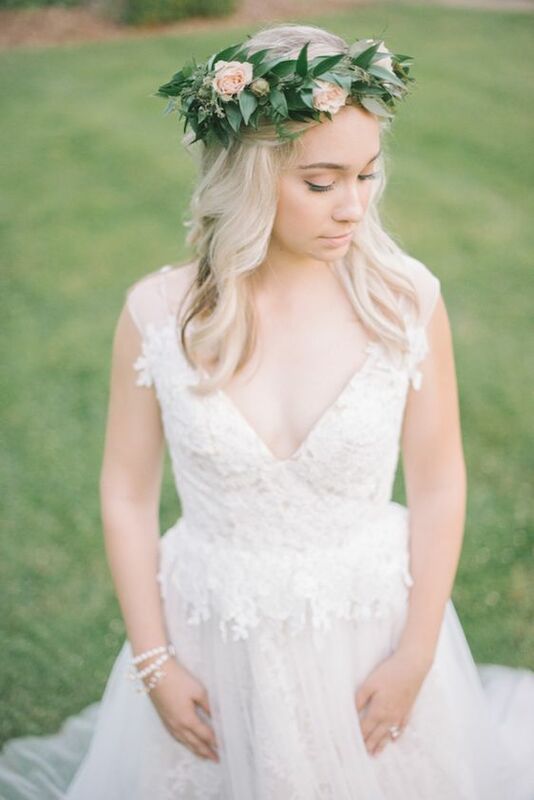 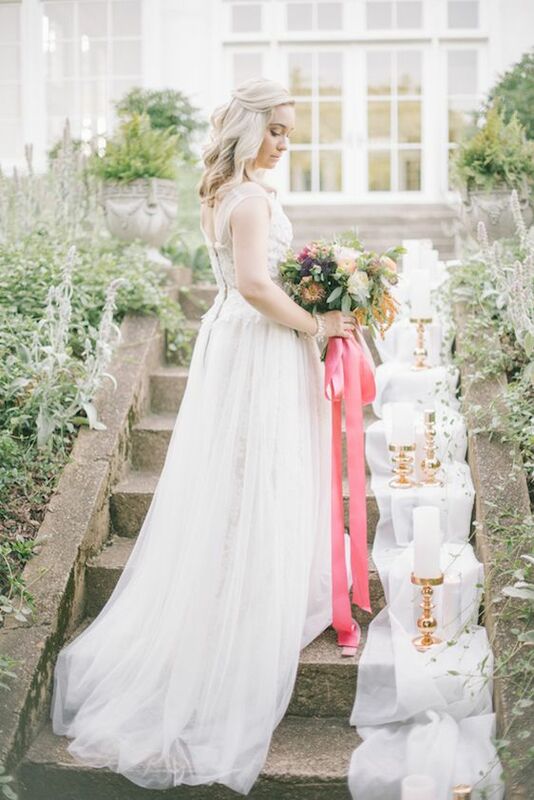 A wonderful team of creatives collaborated on this beautiful inspiration shoot and what a beautiful job they did! 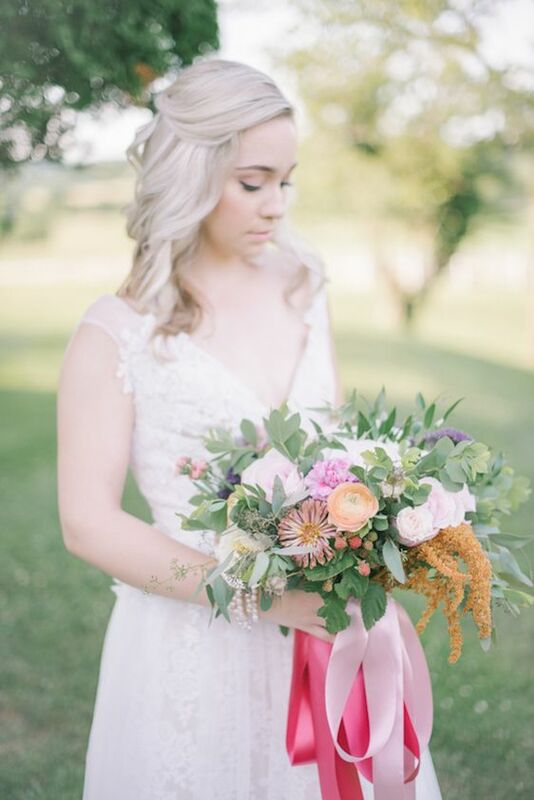 Huge hugs and high fives to all of the talented wedding pros who were a part of making this this styled shoot come to life! 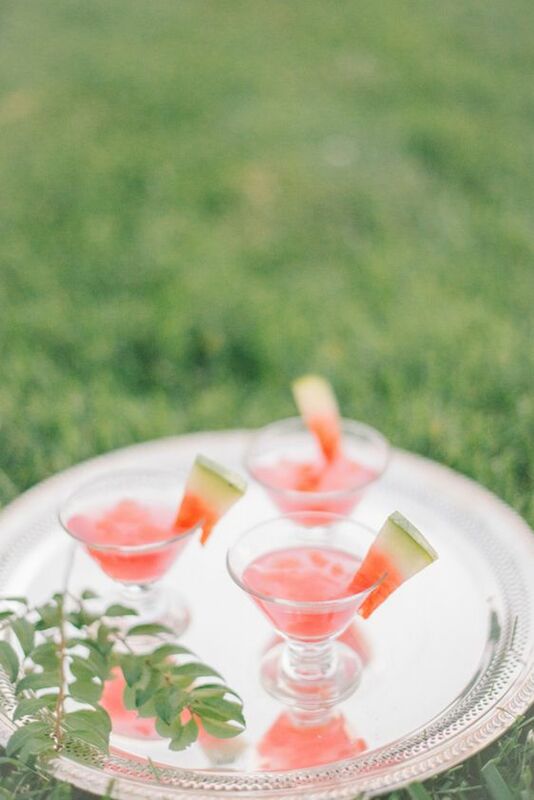 1 One Comment " One In A Melon Wedding Inspiration "